Christopher Costabile is a musician and installation artist currently residing in Palm Harbor, Florida, USA. He has lived in the Tampa Bay area all his life, and holds a BA in English Literature from the University of South Florida. Christopher learned guitar at age fifteen. He attended two years worth of formal guitar lessons and later exercised his proficiency at the instrument in numerous musical outfits. He is also a self-taught keyboard player and percussionist. At age eighteen, Christopher began to write his first songs, quickly advancing his abilities as a songwriter. From 2000 to 2004, he was a member of numerous local bands, several of which performed Christopher’s original material. Since 2000, he has composed over thirty conventionally-structured folk and rock songs. In 2004, after becoming frustrated with performing music in clubs and bars, Christopher embarked on an unconventional career as a solo artist. He acquainted himself with music history, focusing heavily on late 20th century movements such as Minimalism, Procedural music, Musique Concrete, Aleatory composition, Free Jazz, as well as Ambient and Atonal methods of composition. Since 2004, Christopher has put these methods into practice in several dozen instrumental and avant-garde compositions. At the beginning of 2008, he released a compilation album of this work on the Lunar Flower Netlabel, entitled Anomalies: Instrumental and Experimental Recordings, 2004-2007. In 2006 and 2007, Christopher developed his budding interest in art by studying many different 20th Century art movements. In 2007, he combined his love of installation art with his knowledge of the ideas governing Brian Eno’s Generative Music compositions and created his first music installation, Naive Astronomy, for six stereos, which was exhibited at the GALA CORINA art show Iluminación in November of 2007. 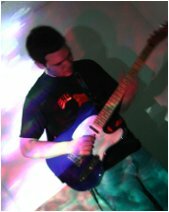 In 2008, Christopher released his first album of ambient music and began to perform these compositions in live settings. He has performed at The Tampa Bay Museum of Art, ARTpool, Sacred Grounds Coffeehouse, and other notable venues in the area. He has also continued to exhibit his installations at art galleries such as The Arts Center, The Beaux Arts Gallery, Progress Energy Art Gallery, and ARTpool. In 2008 and 2009, Christopher worked closely with film makers Jason Kushner and Bradley Paul Valentine, contributing several tracks to their films. In 2009, Christopher's music was featured in Kushner's film, American Colonies: Collapse of the Bee, which was an official selection at several national film festivals, including the Boston Film Festival. Outside of the musical spectrum, Christopher has a wide-ranging knowledge of both foreign and short films, and is an accomplished writer. In addition to his academic work as an English Literature major, he has ample experience in writing grants, resumes, reviews, professional letters, and other business documentation. He has written well over a hundred poems and short stories, and currently dabbles in freelance writing and editing. Earth Mantra is very proud to be bringing the work of this accomplished artist to our audience.